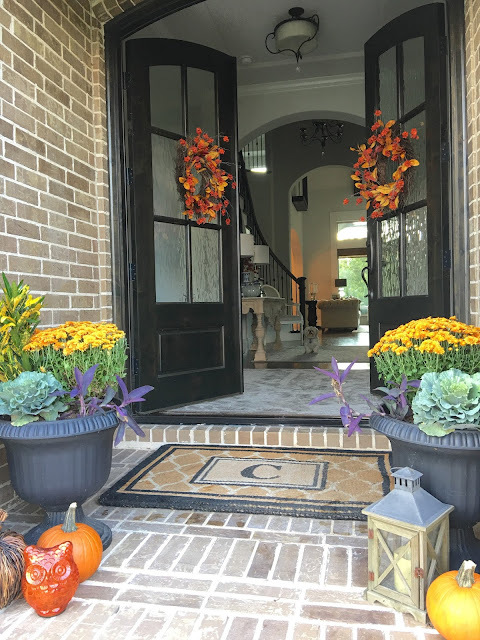 My front porch is all decked out for fall! This is my favorite fall porch yet. I usually just throw a couple of pumpkins and mums outside without too much thought and it's fine, but this year I went all out with double wreaths and a variety of fall plants in the planters. Here comes Mario the minute I open up these doors! I used crocus, kale, mum and a trailing purple vine in each planter. I just love the mix of colors. I only bought two small pumpkins because it's still warm here and there's a chance I may have to replace them before Halloween. I found the wreaths at Hobby Lobby. I decided on something minimal since there are two of them and really wanted to use traditional autumn colors because they pop against the brown brick and stone. It was also nice they were 40% off! Even though it's still warm here, the evenings have been pleasant enough to sit outside. We had the best time this weekend barbecuing, swimming and watching TV on our back porch. I just love this time of year! Such a pretty porch, love all the fall colors in the planters. Bring on the cooler weather. Thank you! Yes, bring it on! I'm ready! Thank you! I decorated very early so you still have plenty of time!